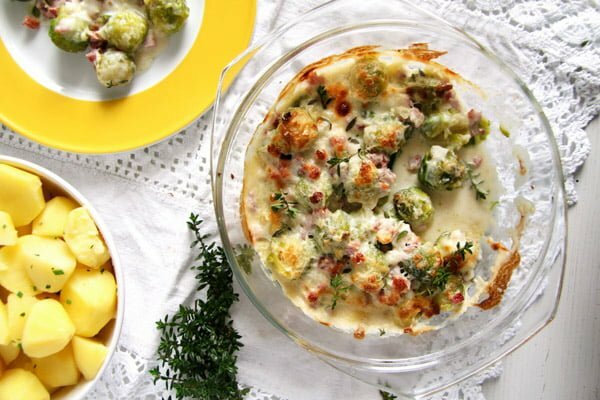 An easy Brussels sprout casserole recipe with bacon and a delicious cheese sauce with Parmesan and cream cheese. 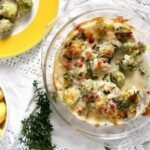 If you think you are not that much into Brussels sprouts, you should give this recipe for Easy Brussels Sprouts Bake with Bacon and Cheese Sauce a try, I think you might change your mind about the sprouts, this is a really entry-level recipe for the sprouts. Or this Roasted Brussels Sprouts with Orange and Parmesan. I did not have Brussels sprouts as a child, I have never even seen them in Romania during my childhood, they were something we only knew by watching American television series, where somebody often seemed to be hating Brussels sprouts. 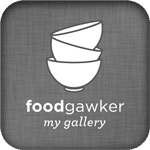 Nonetheless, after seeing some close-up photographs of the Brussels sprouts in some magazine once, I knew that Brussels sprouts are something that I would definitely like to try and that I would probably like very much. I thought that because of the way they look, like miniature white cabbages, so pretty, so irresistible. I have always loved white cabbage and the thought of eating that in such a beautiful form was very appealing. Well, in the meantime I have learned that Brussels sprouts do not taste that much like white cabbage, they have their own unique flavor and consistency, but still I was right in thinking that despite all the anti-propaganda in American series I would still love these particular veggies. I am posting this recipe during this Saxon series because I feel this to be a very German-style recipe and because when cooking it for the first time, I was inspired by several recipes found in a Saxon cookbook, which I kind of mixed together. 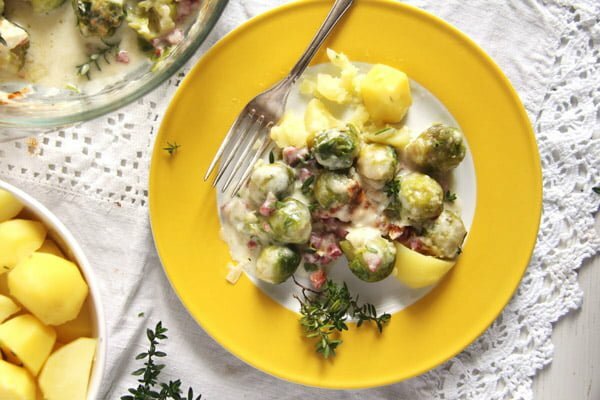 The result was so delicious (for me and my husband, forget the kids when it comes to Brussels sprouts), that I kept making this recipe several times to find the most satisfactory combination. I tried several cheeses and found Parmesan to be the best, but Gouda was also delicious. When it comes to ham, I have made this for the first time without any ham at all and it was good. Then, I’ve tried it with cooked ham and found it better. However, the bacon did bring the most flavor, it was definitely the winner for us, the saltiness and heartiness it gives to the dish cannot be matched by the use of cooked ham. The most important thing when cooking Brussels sprouts, if you ask me, is to take care not to overcook the sprouts. I think that is the main reason why so many people do not enjoy eating Brussels sprouts. I can understand that the kids are put off by the slightly bitter taste of the sprouts, but that is actually a plus in the issue of taste when it comes to adults. I think most adults don’t like the mushy consistency of many Brussels sprouts dishes. And that is really so unnecessary, cooking them beyond recognition. I feel the same when it comes to broccoli or cauliflower, well generally, mushy cooked vegetables are not for me. 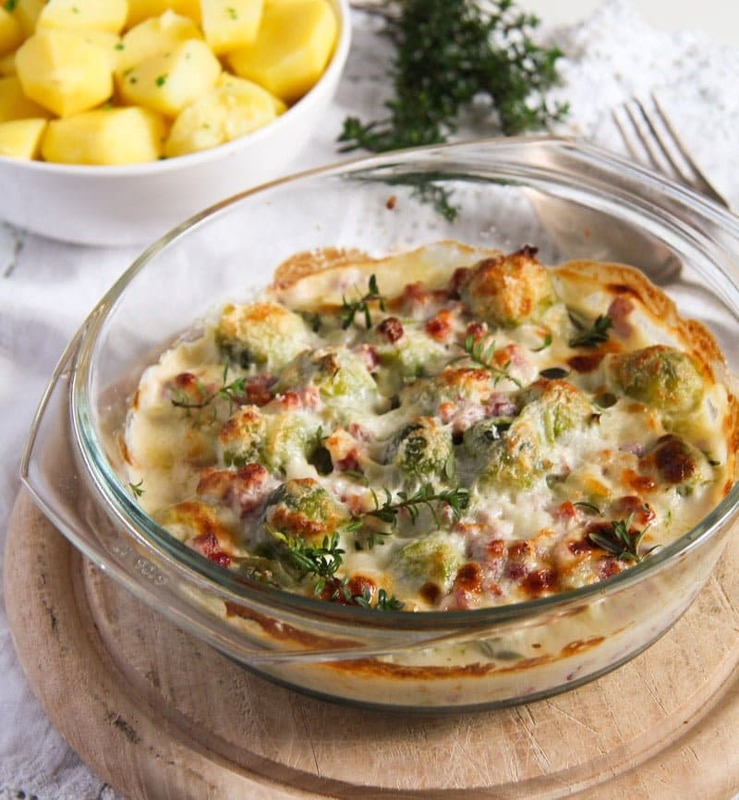 So, in the case of this particular Easy Brussels Sprouts Bake with Bacon and Cheese Sauce, make sure you only slightly pre-cook the sprouts before assembling the casserole, they will continue to cook in the oven. 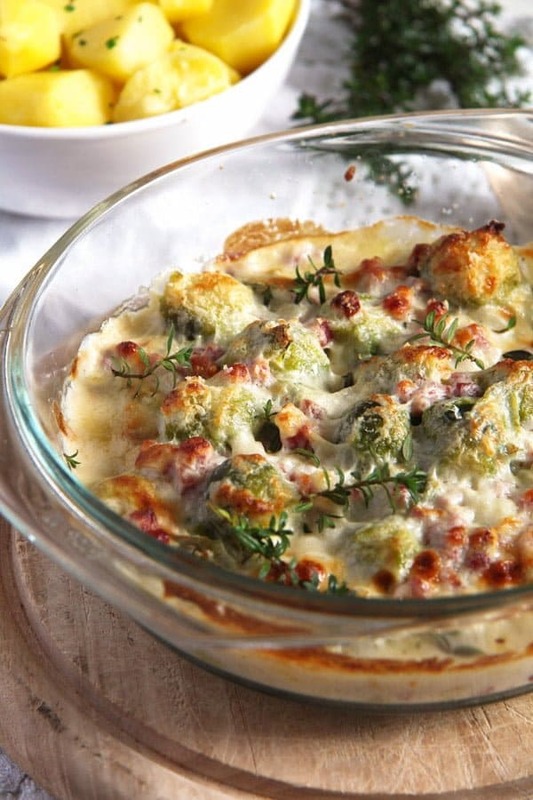 And another bonus: if you happen to have not too soft, leftover Brussels sprouts from Thanksgiving dinner, they would be perfect to make this easy bake. Preheat the oven to 220 degrees Celsius/ 430 degrees Fahrenheit. Butter a casserole dish. In the meantime clean the sprouts, if necessary. Remove their outer leaves and the thickest, lower part of the stem. If the sprouts are very large, halve them. If I use frozen sprouts, I don't bother to defrost them, I give them to the water in their frozen status. When the water starts to boil, add some salt and then the cleaned Brussels sprouts. Cook for about 4-5 minutes and already check the consistency of the sprouts, they should still be rather firm, they will continue cooking in the oven and they should not get too mushy. If you feel they are still too firm, continue cooking for another few minutes, then check again. The cooking time depends on the size of the sprouts, so keep checking. Melt the butter in a small saucepan. Add the finely chopped onion and the bacon cubes and cook until the onion is translucent. Add the heavy cream and the grated garlic cloves and bring to a simmer. Remove from the heat and whisk in the cream cheese, freshly grated Parmesan, finely chopped herbs and some gratings of fresh nutmeg. Adjust the taste with salt and pepper. Stir well. If you find the sauce to be too thick, you could stir in a small amount of milk. Drain the Brussels sprouts and give them to the buttered casserole dish. 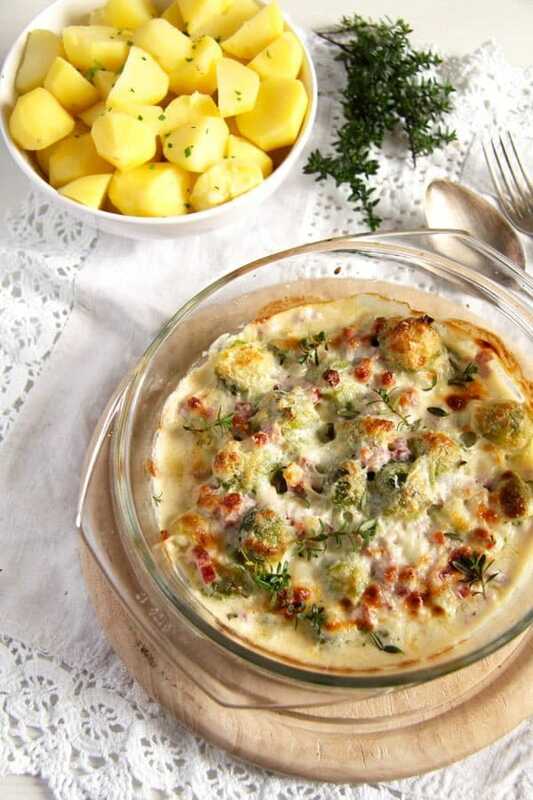 Pour the sauce over the sprouts and bake the dish for about 15 minutes or until the cheese is golden and bubbling. Serve hot with green salad and boiled potatoes. I have made the recipe with fresh Brussels sprouts, about 750 g/ 27 oz, which I cleaned by removing the outer leaves and the thickest part of the stem. If they are very large, halve them. But you could use frozen sprouts as well, about 600-650 g (21-23 oz) for 2-3 people as a main dish with potatoes and salad. Delicious! Have been eating lots of brussels sprouts and now my stomach starts to complain…my husband forbids me to eat more Kohl&Co. I love Brussels sprouts but you are right, they tend to have a bad reputation, especially among children! I usually just roast them but I love the idea of pairing them with this cheese sauce and that bacon – YUM! Ooooh, maybe this gorgeous recipe will be the one that FINALLY convinces my husband that Brussels sprouts are wonderful things! Yay! Can these be prepared a day in advance for a dinner party? Hi Darlene. I have never made them in advance, but I suppose it can be done. Or you cook the sprouts in advance, make the sauce without the herbs, let it cool, cover it with plastic foil directly over the surface so that it doesn’t form a skin. When ready to bake, mix the herbs in the sauce, add the sprouts and bake.